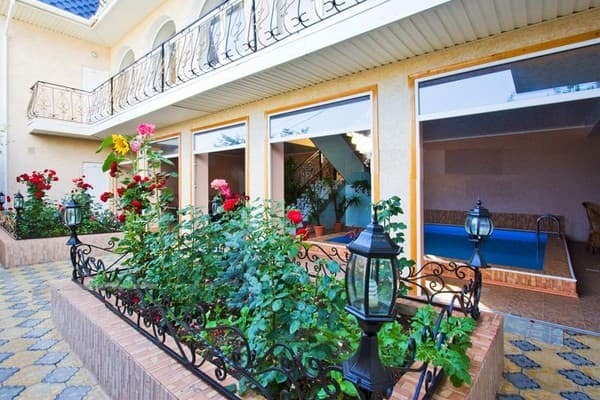 Mini-hotel "Crimea" is located 120 meters from the sea and is equipped with 12 triple rooms with all the amenities of the category "junior suite" for family or company rest and 3 luxury rooms for a romantic and unforgettable stay. On the second floor there is a cozy lounge with leather sofas. On request, cleaning in the rooms - every day. There is an own shop under the hotel. For guests, the hotel's chefs can prepare dishes of European, Asian and Oriental cuisine to choose from and strictly at home. Also, the mini-hotel "Crimea" is equipped with a sauna and a swimming pool. Arriving by car, it is possible to leave it near in the parking lot. All rooms have Internet Wi-Fi.The hotel can book any walks (on horseback, on boats) and excursions. At will, fishing is also organized. For visitors of the hotel it is possible to organize a meeting with a train or an airport at very low prices. PRICES MAY CHANGE, YOU NEED TO RECEIVE INFORMATION FROM THE OPERATOR! Description of the room: The room has everything necessary for comfortable living new furniture. Description of the room: The room has everything you need for a comfortable stay. Two-room suite - an ideal option for a small company. 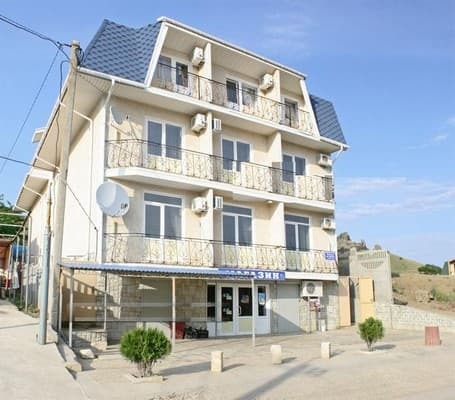 The hotel is 120 meters from the sea and 200 meters from the Karadag Biological Station and Dolphinarium, in the inclined Karadag. From the hotel windows you can see a beautiful view of the sea and Karadag. Five meters from the mini-hotel "Crimea" is a small fruit market. All intercity buses come to the intercity bus station in Theodosia. Leaving the bus, you will see the church. To the left of the church there is a bus stop "Avtovokzal" with which there are minibuses with the number "2" and "4" to the inner bus station (in the center). At the bus station, you need to take a minibus, which goes to Biostantsi. This minibus stops at a single stop in the village of Kurortnoye. Transfer by prior arrangement is possible.